World Goth Fair: Done, and Donated. I have a few more blog posts to add to the Big Post of Blog Posts, but it’s now June 1, and WGF 2012 is officially closed. 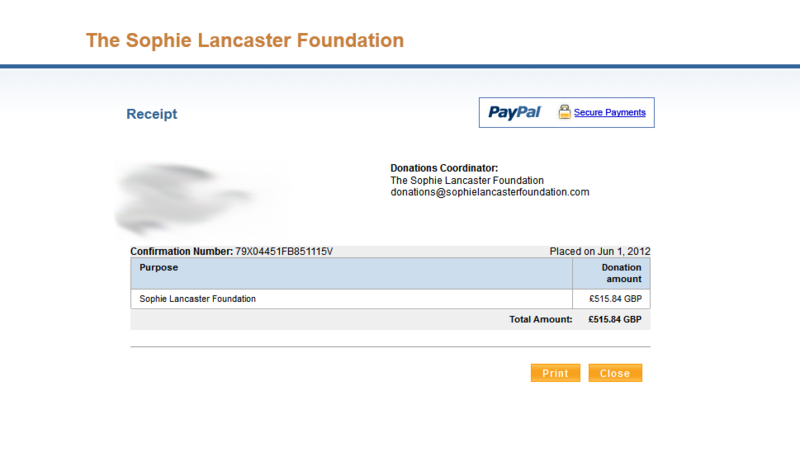 That being the case, Ive pulled everything out of the charity account, converted it and sent it along to the Sophie Lancaster foundation. See the screencaps below for all the details. This was the total in the charity account. It’s a screencap from the charity account’s dashboard. I then cashed the money out via Virwox. yes, the Lab would have given me a few extra dollars, but it would have taken four days and I wanted it out NOW, so there was no speculation on where the money was or why there was a holdup. 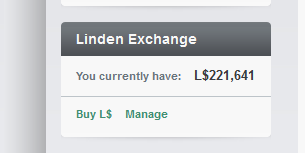 This screencap is from my paypal account showing how much got transfered there once fees were accounted for. I then converted that amount to pounds, since that’s the currency the Sophie Lancaster Foundation takes donations in. This is the screencap of that conversion from Google. I then donated that amount. This is the screencap of confirmation of that- Ive smudged my mailing address. Finally, here’s the receipt from paypal for the donation. Again, I’ve smudged my mailing address. The money is in their hands now. Huge thanks go to everyone who helped pull this event together- Dare for building it, all the merchants for participating so eagerly, the bloggers for all their wonderful coverage, the staff of Gothika for pulling off that epic 13 hour marathon, and Lee and Martin for concocting this whole ridiculous thing in the first place. I will add a link to the news item to our f/b page to show people what you have done for us ! I don’t have a facebook acc0unt but if someone could shoot me the link to that, I’d appreciate it. Thanks. World Goth Fair: Blog Posts! World Goth Fair is fortunate to have a number of official bloggers, and a bunch of other folks writing about it! If you have a blog post about World Goth Fair, send it on in and I’ll post it. We’ve also been featured in the SL Destination Guide here. If you’re one of those Facebooky type people, give it a “like” if you’re so inclined. I got a call down to Cursed a few days ago to fix a misbehaving script, where I ran into Devin Vaughn and his lovely lady friend. He told me he was blogging the fair and both of them were just delightful people. I introduced them to the Gothika (and goth fair) mascot, Orvan (beloved by all, no eating him in ways he doesn’t like.) He filed this terrific post, and Im *thrilled* that Orvan and his namesake Batmoos got blogged. Thank you Devin! Thanks to everyone who’s blogged World Goth Fair so far. If you have a post (or a bunch of posts!) you’d like to share, just let us know! World Goth Fair: Hey, we’re open! World Goth Fair 2012 is finally open. You can get your goth on across two sims worth of dark goodness. And hey, we have a flickr group, too! You can find it here. You can find out which stores are on what sim by going to this handy dandy page here. Come on down and get your goth on! World Goth Fair: Master Shop List! There’s a page for that. World Goth Fair: Attention Bloggers. This morning, Dare and I had a meeting to discuss the policy regarding bloggers for World Goth Fair. We decided jointly that we would prefer to include anyone who would like to participate with us, and not have a limited list of official slots. That being said, if you would still like to join us, please tell us. We will send along a blogger’s welcome package, and if you would like I am happy to invite you to the World Goth Fair group. We think anyone who wants to help out should be able to, and there should be no limits on how many slots there should be for bloggers, as they don’t require booth space or some other finite resource. We apologize that it took us time to decide that, and if you’d be willing, we’d like very much to have you participate. World Goth Fair: We are SOLD OUT of large booths on Dark Eternity. As of right now, we are sold out of large booths on Dark Eternity. We still have a couple (and by a couple, I literally mean two) left on Cursed. OODLES of smalls (and I don’t see any reason why two adjacent smalls can’t be made into a medium) on both Dark Eternity and Cursed. World Goth Fair: We have bloggers! While we hope that lots and lots of people blog the things they see, experience and buy at World Goth Fair, we do have four official bloggers for this event, and I’d like to take the time not only to introduce them, but thank them so much for taking the time out to help us promote the fair and the charity. First up, we have Shadowed Darkfury- most of you know her, as she owns Dark Water Designs and runs SL Freebie Hunters with her partner, Thanos. Shadowed has been my friend for a long time, and she’s a terrific person with a keen eye. She really is excited for the fair, and has her store in it as well. Ely Hynes blogs from Sium . Ely has a great talent for combining looks and styles to create new and exciting visual expressions. She’s great at this, and we’ll be seeing lots of terrific combinations from her. I think Ely is just an all around great person, and I asked her if she would cover the WGF because I knew she’d so such a wonderful job. Rudhmellowen Laguna blogs for the extremely popular Seraphim, and is their go-to girl for dark looks. She is a great supporter of the Sophie Lancaster Foundation and is very excited that there is finally a fair for the gothfolk in SL. I want to thank them all for joining us for the fair, and give them a warm welcome. They’re all extremely nice people and I am honored that they are so enthusiastic about this project. I can’t wait to see what they come up with!